Dragon-i 10th anniversary feat. 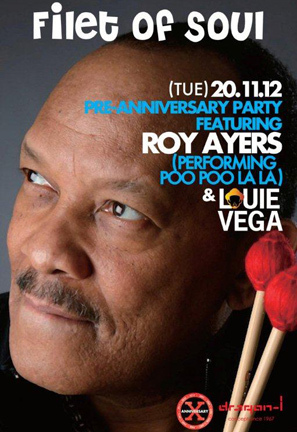 Roy Ayers, Louie Vega + more! With hits spanning every genre from jazz to disco, Roy Ayers’ music has been sampled and remixed countless times over the years, contributing the essence to many other famous songs. Next Tuesday he will be joined by legendary New York producer and DJ, Louie Vega, a man who has pioneered soulful dance music for several decades himself. If you’re a fan of quality music, this promises to be an exceptional night! Over the last ten years Dragon-i has put Hong Kong on the global party circuit and brought a flood of international talent to our city. The 10th anniversary is a major milestone and a very impressive accomplishment in a business that moves as fast as nightlife does. Under the direction of founder, and music lover Gilbert Yeung, Dragon-i has been Hong Kong’s most influential nightlife institution for a decade. Despite all the new places that have opened, Dragon-i is still the measuring stick by which all other clubs in the city are judged. Dragon-i’s interior design, sound system, crowd, and ambiance elevated Hong Kong’s clubbing experience to an entirely new level. To this day it’s a destination for many of the world’s biggest celebrities who pass through Hong Kong. Congratulations to Gilbert and the Dragon-i family! Looking forward to seeing many familiar faces during the anniversary! Louie Vega and Dragon-i founder Gilbert Yeung in 2005! Stay tuned for more events in the series coming soon, including the official anniversary on November 24th, featuring Luciano, and a third event starring mega-hit producer Calvin Harris on December 5th! Club AVENUE opening feat. Vinyl Richie! “Hot in the 852” feat. Daniel Wu?